To make my reinterpretation I’ve been inspired by a typical dish named “Paparot”. I had to try these instant polenta and ground chicken recipe a few times, but now I think I found the sweet spot. I was looking for an easy meal idea and I came across this dish. I immediately thought that it would fit my current macros (40|30|30) perfectly. After glancing at the recipe, I thought _“ What the hell is this greenish slop?”_, but I was really intrigued and, suddenly I was craving a full steaming bowl of it. 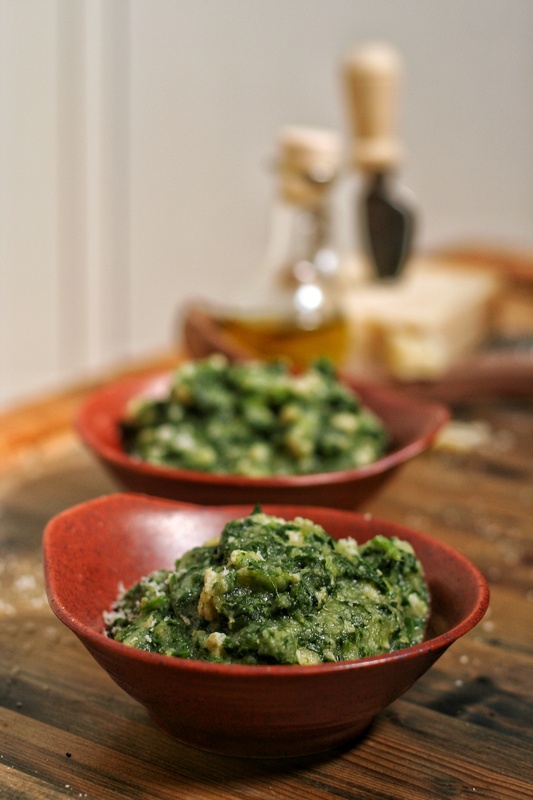 Basically the original Paparot is a spinach and polenta soup seasoned with butter, lardo or pancetta. Polenta is often used in traditional Northern Italian cuisine, so you can find a lot of recipes that call for this kind of flour in these lands. I found a couple of different versions made with crumbled sausage, so I swapped it with some minced chicken instead and made a one-pot meal. I checked all the ingredients crossing out the bad ones, trying to find some good alternatives, adding some extra items and this is the outcome…a delicious, nourishing and most of all really simple dish. I made a huge serving and ate it all at once, but it probably yields 2 servings. To make these Instant polenta and ground chicken bowls, I spent a total of €2.92 and € 1.46 per portion. As always cheap and put together in less than 15 minutes! I make it during the muscle building phase (someone calls it bulking, but I don’t like this term pretty much). I consider it a winter comfort food (…oh really?! ), but it could be nice sliced and grilled on a bbq on a sunny summer day as well. Sounds like a plan for this scorching late never-ending-summer. I really love having this dish on my table during fall time, especially when it’s cold outside and winter is coming. When carbs are going up and strength workouts are getting tougher I often make this Polenta with ground chicken bowl recipe. Especially for lunch when I train in the afternoon. Now I am going to show you how to make it my way. Spinach : I often use them frozen, but when in season I love the fresh ones. Here you’ll find an illustration about the difference. Olive oil. I always go for the extra virgin olive oil. I prefer the northern Italy oil, it’s lighter and more scented. A great purchase is the Ligurian extra virgin olive oil. Chicken breast. The yellower the better. When it’s possible and affordable I buy organic. Here in Milan it’s quite easy to find a good and well farmed chicken breast, but the issue is the price, sometimes it’s just over the top. Salt. I don’t get involved in that fancy pink Himalayan salt thing… 🙄 ! I can use iodised salt so I go for it. Pepper. I prefer grain pepper grinding it on cue. Water. Filtered works better for me otherwise I use still bottled water. 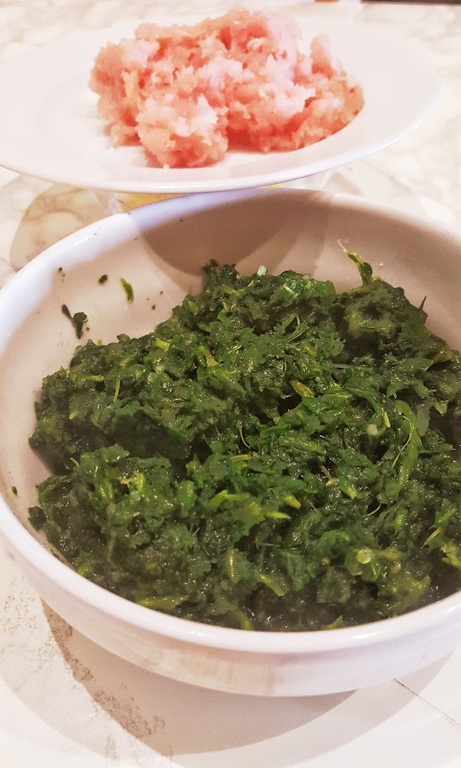 Cook the spinach in water, steam or microwave it till tender. In a food processor blend it roughly, it shouldn’t become a cream, spinach has to be recognisable. Grind the chicken breast or use an already minced one. Add a ladle of water in a non stick pot along with olive oil, salt and pepper. When it simmers, add the minced chicken and stir it well. 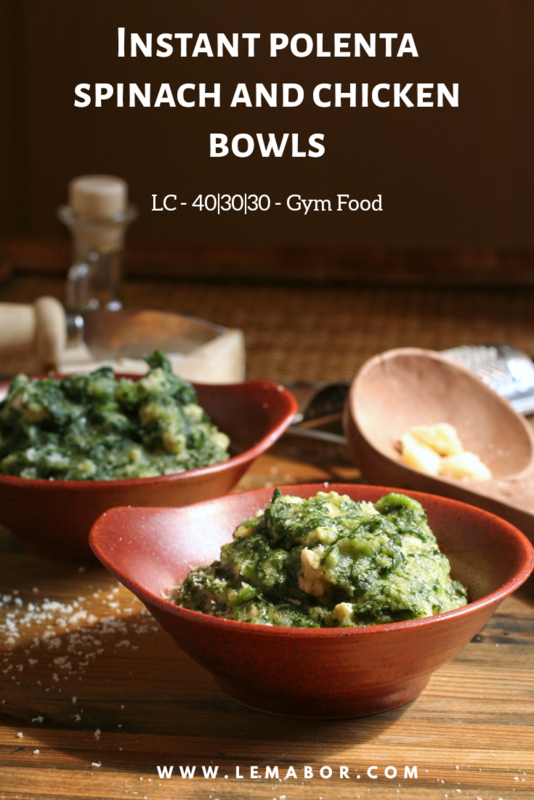 Heat up and cook it for a couple of minutes, then add the spinach mixing homogeneously. Add the water and sprinkle the flour in, stirring all the time. 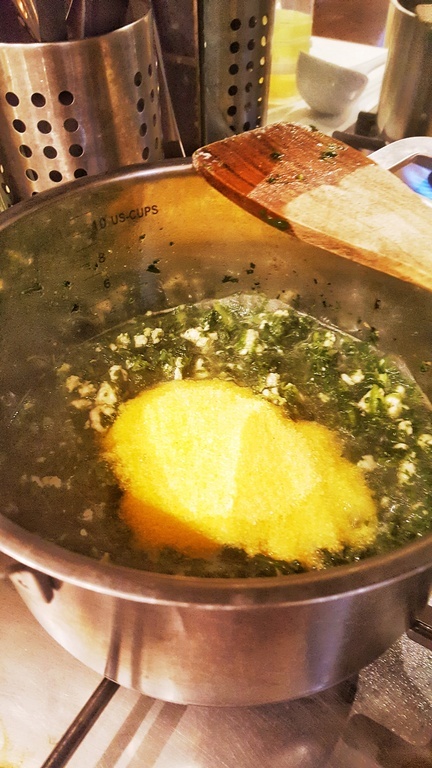 When it starts to bubble, reduce the heat and let it cook for 3 – 4 minutes (or as described on the instant polenta box instruction) stirring often. It is done when the surface starts to bubble with air puffs. Let it set for a moment to make it firmer. 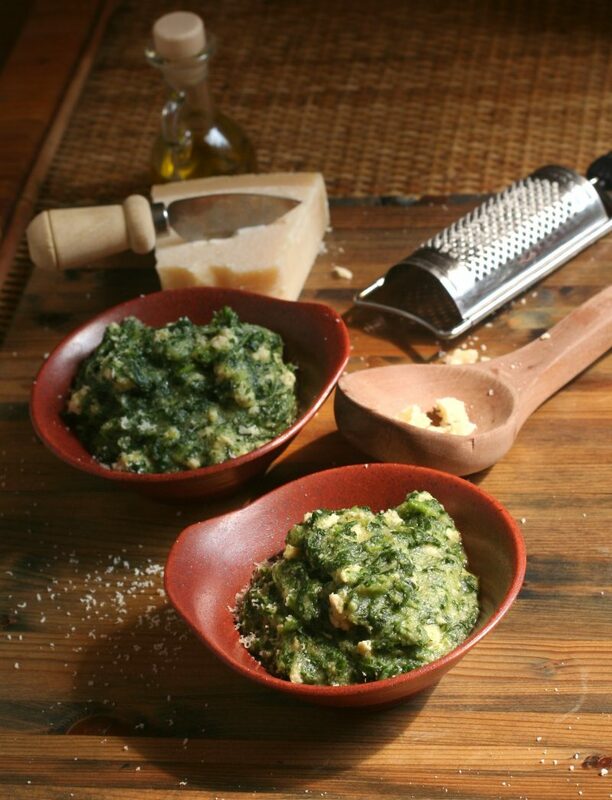 In a food processor blend it roughly, it shouldn't become a cream, spinach has to be recognisable. When it starts to bubble, reduce the heat and let it cook for 3 - 4 minutes (or as described on the instant polenta box instruction) stirring often. It is done when the surface starts to bubble with air puffs.